The Centers for Medicaid & Medicare Services has released updated final scores for the 2017 Merit-based Incentive Payment System performance period. If you believe Medicare has made an error in your 2019 MIPS payment adjustment calculation, you have only a few more weeks to request a targeted review. 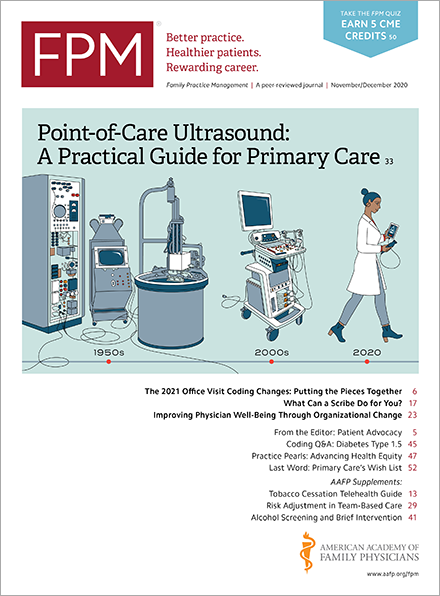 The Centers for Medicare & Medicaid Services has released feedback reports telling eligible physicians and practice groups how they did during the first full year of complying with the Quality Payment Program. The Centers for Medicare & Medicaid Services has updated its Quality Payment Program participation tool and QPP website to make it easier to check eligibility and review quality measure data. The Centers for Medicare & Medicaid Services is investigating a new payment model that would directly contract with Medicare providers and suppliers. Family physicians saw their annual compensation increase an average of 5 percent over last year, reflecting an industrywide rise in physician pay. The Centers for Medicare & Medicaid Services has updated its Merit-based Incentive Payment System Eligibility Lookup Tool to inform physicians if they must report for the program in 2018. If you have not already done so, you have until March 31 to provide 2017 data for the Merit-based Incentive Payment System (MIPS), which could affect your Medicare payments in 2019. If coding rules followed common sense, this would be easy. You would just have to ask: Have I seen the patient before? Unfortunately, that straightforward approach does not work. If you used claims to submit 2017 quality data for the Merit-based Incentive Payment System, you can now find out how you did.